NinjaTrader comes with over 100 pre-built technical indicators, which can be added, removed and edited via the Indicators window. Indicators can be applied to charts, the SuperDOM, or Market Analyzer columns, and custom technical indicators can be created via the NinjaScript Editor. The Indicators window is used to add, remove and edit all indicators within a chart. •Use the default Ctrl + I Hot Key when the chart has focus. The image below displays the three sections of the Indicators window. 2.Left mouse click on the indicator you want to add in the "Available" section, then press the add option in the "Configured" section. Alternatively, you can simply double click on the indicator in the "Available" section to add it to the "Configured" section. You can customize any indicator from the Indicators window. 3.Once highlighted, this indicator's parameters will be available to edit in the "Properties" section. Please see the "Indicator Input Series" section on this page for further information. The label displayed on the chart. Leaving the field blank will remove the label from being displayed on the chart. Enclosing a label in quotations ("MyEMA" for example) will display the text within the quotations and exclude the system added trailing series information. Determines the maximum number of bars the indicator can look back to perform calculations on historical data. This is set to 256 by default (the most memory-friendly setting), but it can be changed to "infinite" to allow for a greater look back period. Sets the panel in which the indicator is plotted. 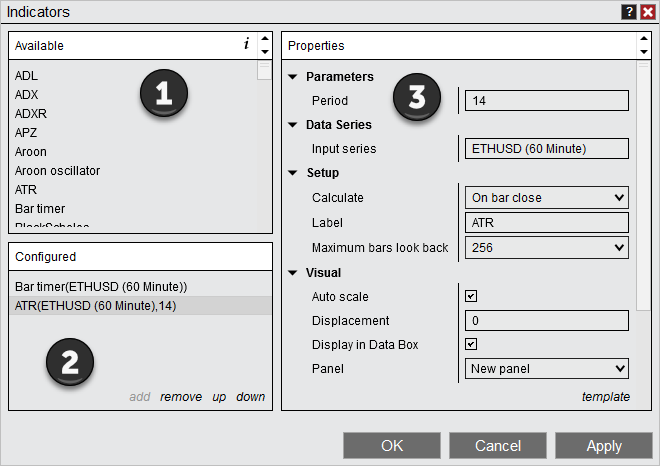 If you select "Same as input series," the indicator will be linked to the Input Series and automatically move if the Input Series is modified to a different panel. When enabled, the indicator value is plotted in the axis selected under the "Scale Justification" property. Sets the scale on which the indicator will be plotted. Possible values are "Right," "Left," and "Overlay"
You can optionally save your customized indicator's parameters as templates. Saving it as Default will recall your customized settings the next time you add that specific indicator to a chart. Please see the Saving Chart Defaults and Templates page for more information. The indicator Input Series dialogue allows you to select the Input Series for your indicator's calculations. To access this window, left mouse click within the "Input Series" field. You can then select the Close, High, Low, Median, Open, Typical, or Weighted price of any Data Series applied to the chart. Alternatively, you can choose another indicator as the input series. 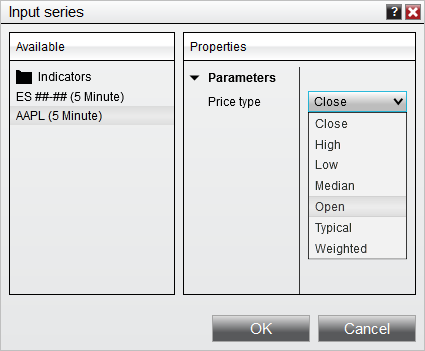 When you select another indicator as the input series, The "Properties" section of the Input Series dialogue will display properties related to the indicator being used as the Input Series, allowing you to configure it to your desired settings. This allows you to nest multiple indicators. Once you have selected the Input Series of your choice, left mouse click the OK button to exit the Input Series window. In the image above, we can select one of the Data Series applied to the chart, or another indicator, for use as an indicator's Input Series. Note: To take advantage of this feature NinjaScript indicators will need to implement the Input ISeries as their main data input. •Open the Indicators window (see the "Understanding the Indicators window" section above). Next, select an indicator from the "Configured" section, then select the Remove option, and finally press the OK button to exit the Indicators window. •Left mouse click to select the indicator on your chart, then press the Delete key on your keyboard. •Left mouse click to select the indicator on your chart, then right mouse click the indicator and select the Remove menu item. In addition to the indicators that come pre-built with the NinjaTrader application, you also have the ability to create custom indicators of your own. 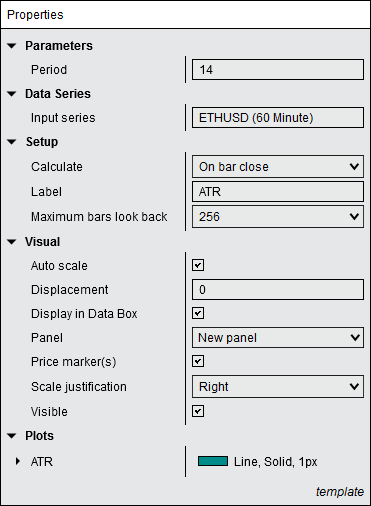 For example, you could create your own custom multi-series indicators using price and volume data to apply to your charts or share with fellow traders. For more information on using NinjaScript to build custom indicators please see the NinjaScript section of the user help guide, or click here to view NinjaScript indicator-development tutorials. Please see the Working With Columns page for information on working with indicators in Market Analyzer columns. Please see the SuperDOM Working with Indicators page for information on working with indicators in the SuperDOM.